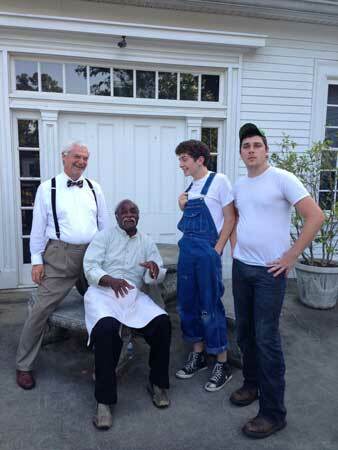 Here are some cast members from Second Samuel, the play opening tomorrow night at the Wm. Miller Bouknight Theatre in Edgefield, photographed just before the curtain was raised for the Monday night dress rehearsal. They are the town doctor (far left), Woodward (far right), U. S. (seated) and B Flat (in coveralls). His name was Bernie Flat – or Bob or Billy, or something that started with a “B” – but it was Miss Gertrude who changed his name to “B Flat,” because he felt he was not musical and the name would then make him so. Miss Gertrude was about helping people and she dies. B Flat is the thread that holds the play together. He addresses the audience in his musings, laying out the problems of the town of Second Samuel and the conflicts among its residents. The audience will find this sixteen-year-old (in real life) a delight as he reflects the good and the bad in what he sees.